TS Rising made it to the Top 100, we need your votes again for Phase 2 to make the Top 10. Support TS Rising vote Now! This weeks update we have the Nod Attack Buggy, GDI Limpet Drone and the Blue Tiberium Fiend! How to Vote!When ready click on the MOTY logo below, you will be taken to the Top 100 voting page, at the top is Top 100 Released mods, scroll down to Top 100 Upcoming mods. We are listed under Command & Conquer 3 Tiberium Wars, and are at the bottom of that list click the Vote icon and you should see something like the screenshot below. Thankyou for your support! Thanks for that, now onto the Update! 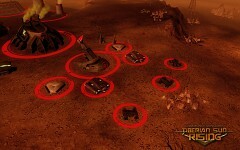 The Attack Buggy has been a part of the Brotherhood's forces since the First Tiberium War, a light attack vehicle for providing anti-infantry support and reconnaissance. Its an all-terrain vehicle and unlike its predecessor it has a closed canopy, it also has a lower centre of gravity being closer to the ground as well. The advances Nod has made in Stealth Technology, has forced the GDI to develop methods of detection beyond their Mobile Sensor Array which is primarily for detecting stealth attacks finding a Brotherhood base under the cloak of a Stealth Generator has proven difficult for the GDI. In response their new affront to the Technology of Peace is called the Limpet Drone. From what intelligence of field testing of this Unmanned Vehicle has determined the Limpet Drone burrows itself into the ground at a chosen location. When a enemy vehicle is detected nearby it will attach itself to the bottom of the vehicle, it is equipped with sensor's to detect and see essentially what the target vehicle see's and will also slow down the vehicle it is attached to hence the name Limpet Drone. Be watchful for this Brother screening of vehicles with Repair Bots to remove these annoyance's is recommended to ensure your base's location is not compromised. Peace through Power! Unconfirmed reports have been made by the only survivor of a GDI Convoy which was attacked while travelling through a Tiberium Wasteland. The survivor a pilot of a GDI Titan class Mechanised Walker. Described the creature as a Tiberium Fiend but unlike previous descriptions this evolution of the Tiberium Fiend appears to be stronger able to survive multiple blasts from a Titan's cannon the pilot described it as a walking "Tank". 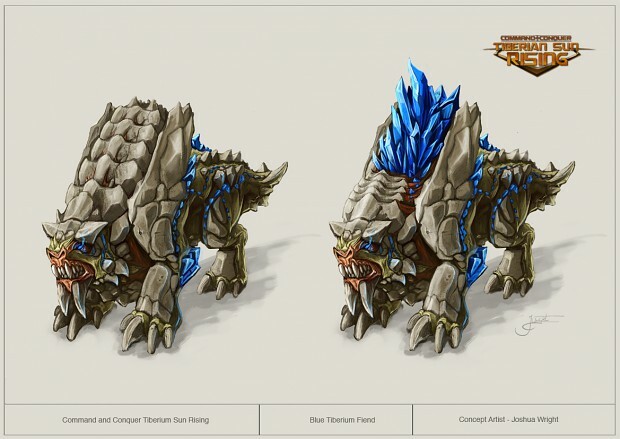 Over its back is a armour plate which retracts to reveal Blue Tiberium Crystal's on the back of the creature. Which a lot like its cousin the previously encountered Green Tiberium Fiend it launch's crystal shards from its back. But due to Blue Tiberium or as renowned expert on Tiberium Dr. Ignatio Mobius refer's to as "Vinifera" the unstable nature of the crystal makes these shards explosive and proved to be deadly against armoured vehicles. 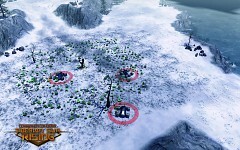 The retractable plate covering the Blue Tiberium crystals when it is not attacking is believed to protect the Fiend from being detonated by weapons fire. More coming very soon! stay tuned! You've all been wanting a new video your wish shall be granted soon :). We're also now on facebook head on over to our page and become a fan! if its for the brotherhood i ll vote. just kidding, i d vote this awesome mod even if it was for gdi! I love you! Such a good community service! You put so much effort into your updates, it's great! I'm looking forward to the video, thanks for your effort! "The retractable plate covering the Blue Tiberium crystals when it is not attacking is believed to protect the Fiend from being detonated by weapons fire." Does this mean that it is vulnerable while hiding in tiberium?